The world as we know it has ended, but Hope County's story is far from over. Seventeen years after the global nuclear Collapse, its Survivors have emerged into a world reclaimed by a vibrant "superbloom" of plant and animal life, and started to build a new world from the wreckage of the old. Get ready to tear up Hope County – figuratively, in a custom off-road dune buggy, or literally, with a beastly sawblade launcher. Build and discover a wide range of weapons and all-new rides, ranging from motorbikes to attack helicopters, and use them to teach the Highwaymen what chaos really means. A new generation of Guns for Hire stands ready to join the battle against the Highwaymen, from hopeful teen Carmina Rye to septuagenarian sniper Nana. If you prefer Fangs for Hire, Timber the Akita is ready to ride along, and Horatio the boar will smash enemies like a four-legged battering ram. Discover new ways to play, including Expeditions, which send you ranging far outside Hope County on targeted missions across the USA. Closer to home, liberated Outposts can be replayed for a tougher challenge, netting you better rewards if you can wrest them back from the Highwaymen again. The Twins, Mickey and Lou, were children when the nukes fell, and the apocalypse's cruel lessons in survival forged them into the merciless leaders of the ruthless Highwaymen. Now they're fighting to take everything from Hope County's vulnerable Survivors, as well as its other struggling factions. Here are just a few of the makeshift weapons you can build. Check out the "Nailed It" Shovel, "Giant Tool" M-16, "Weedkiller" Flamethrower, and more! A wide range of new, jury-rigged vehicles awaits you in post-apocalypse Hope County, including the buggy, trike and semi. 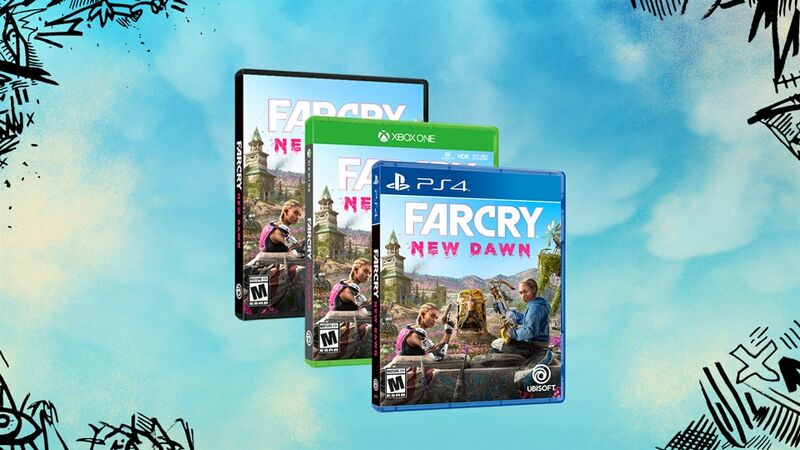 Far Cry New Dawn is available now on PS4, Xbox One, and PC.